In three hours, our table will bubble with the laughter of people who have broken bread with us so often I cannot count the times. This will be our third celebratory meal this weekend, which began on Thursday at the Taggart table. Yesterday we brunched at an elegant home on the Plaza. Having the prodigal son home has considerably improved my social life. I pad around the house with a crystal mug of coffee, making a list in my head of what must be done. Write the Musings, clean the bathroom, cut fruit. . .My thoughts drift back, to my mother's home. I remember the piece of paper divided into eight segments, one chore on each. My siblings and I grabbed one slip apiece and dashed off to get our assigned job done before the cousins arrived. When the timer goes off, start your chore! The heady fragrance of roasting turkey and allspice filled the air. I'm thinking of other Thanksgivings. Oddly, among my favorites stands the Thanksgiving of 1988, which my first husband and I spent in the mountains with no running water and only intermittent electricity. We made Cornish Hens on a wood-burning stove and kept warm next to the fire. I can't remember the Thanksgiving of 1990. I know I spent that Christmas in Missouri, first driving to Kansas City then taking a train to St. Louis, across Missouri during an ice storm, not quite three months pregnant and feeling wretched. But I have no memory of Thanksgiving. Did I go to the Kesls' house? Stay home in Winslow, sulking? Did I drive to Kansas City? I cannot recall. During Thanksgiving weekend when I was about eight, my mother told us that she was going to sort through our clothes to take hand-me-downs for the poor children. I'll take anything you can't wear any more, and the church will make boxes for families who don't have anything to wear for Christmas. She instructed each of us to look through our drawers and in the big sliding door closet, and gather things to donate. Most of my clothes had come from my sisters or our Behan cousins. But I had gotten a grey flannel coat from my grandmother. I stroked its little velveteen collar and straightened its pocket flaps. Nothing else new hung in my closet. My small collection of dresses had all been first worn by other girls. But that coat had its tags on it when I got it! My stomach lurched when I thought about some other child wearing it to church on Christmas Day. I slid the coat from its hanger and brought it over to my bed. I folded it flat, so flat; I straightened its edges and slid each little covered button into its hole. Then I hid it under my pillow. We filled a huge cardboard box with blue jeans, shirts, and sweaters. Someone hauled the box out of the house when the collection ladies came. I ran back to check on my coat: no one had found it. I leaned down and smelled the fabric, my eyes closed. I had had it for two years, but it I could still smell the perfume of the tissue paper in which it had been wrapped when I found it in the box on my birthday. I slept with the coat under my pillow for three days before my mother figured it out. She came to kiss me goodnight that Sunday, asking if I had gotten everything ready for the return to school. She saw the edges of the coat when she bent down. She held it out and looked at me, lifting one eyebrow, not speaking. I didn't want you to give it to poor children, I whispered. I'm sorry. It's just so pretty. My mother sat down on the bed and gathered me into her arms. We sat like that for a few minutes. Then she stood, crossed the room, hung up my grey flannel coat and closed the closet doors. Goodnight, Mary, she said, and then turned to the little boys who slept in their maple beds across the sunroom. Each fall, I clean my closet out. I take anything that I don't wear, or which no longer fits, and bundle it into a black trash bag. I pin matching items together so the thrift store people will know. I haul the bags downstairs to the car, and drive them to the DAV, City Union Thrift, or Goodwill. I don't spend a lot of money on clothes myself. I often shop at consignment stores, just because I know I can get designer brands for a pittance. But I take care of my clothes, and I know they can be used by someone else. And I try to make sure that the clothes which I donate are clean and neatly folded. The grey flannel coat disappeared some time that winter, after the snow fell, during Christmas break. I don't know what happened to it. I wore it to midnight Mass but never saw it after that. I never asked my mother. It probably didn't fit me anymore. I never owned anything like it again; nor did I have anything new again until the pants suit that my Mother bought me for my eighth grade field trip, other than the shoes from Nana and the pajamas from Grandma Corley. In the years since then, I've wondered about the little girl who got that grey flannel coat in the donation box. Did she like it as much as I had? Or did she wish for something new? Did she yearn for something no one had worn before her, something she chose from the racks in a department store, with an attentive clerk hovering around her mother, asking if they needed anything, rushing to find other sizes, other choices, while elevator music played and the overhead lights flickered. An early Ping tells me that someone wants to communicate with me, and I reach for my phone. Ellen wants me to know that she has the flu and I should not come to the farm today. I had learned this from her friend Jerry late last night. We exchange messages for a few minutes. She says she regrets having to cancel my visit and miss Thanksgiving at the Stony Point Church. I send little hearts and type, "Feel better" several times. Then her little icon stands silent and I lie and listen to the wind blow. 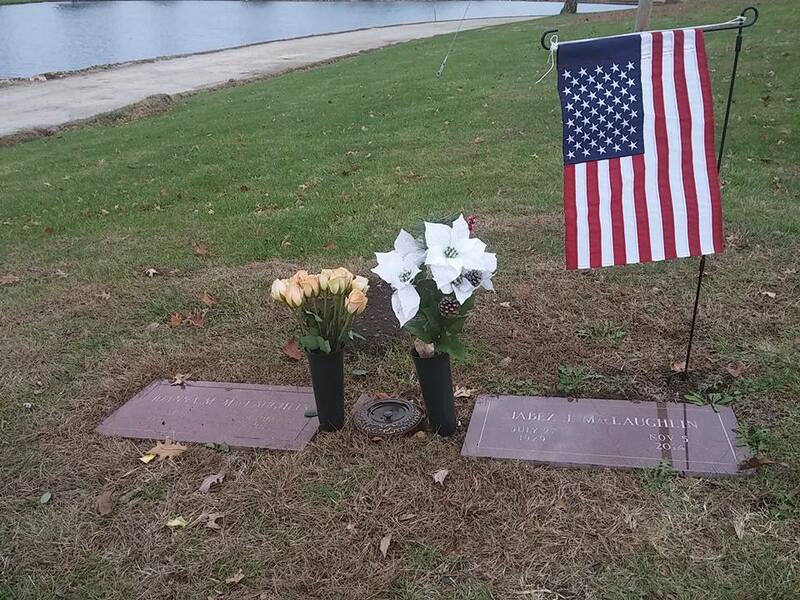 I brought a new flag to the grave of my favorite curmudgeon yesterday. The first one vanished, no doubt blown off its metal pole. This time, I made a kind of lock from twine, something that should keep the flag from slipping off the end and skittering across the lawn into the lake. I brought fresh flowers for Joanna, placing them in bottled water and a cemetery vase from Michael's. The brass one has not yet been replaced. I think to myself for the tenth time: What kind of person steals brass vases from a grave? I would really like to know. Driving down Holmes Road after my cemetery visit, I suddenly think about my mother's grave. She lies in Calvary Cemetery in St. Louis, with my father, my brother, my niece, and a host of Corley relatives. 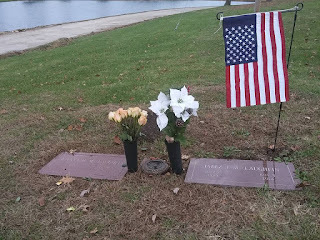 I have not gone to visit my mother's resting place in many years, not since we laid my brother Stephen's ashes there, with a picture of his daughter, a pair of Cardinals tickets, and a Grateful Dead sticker on the side of the brass box. I tried to find Mother's grave once but got lost in the cemetery. On the other hand, I drive to Jay and Joanna's resting place by instinct now. I cannot explain the comfort that I take from my visits. I don't quite understand it myself. But my mother's spirit haunted me yesterday, and a memory rises within me. We're at a cemetery. I can't say which one, we visited so many. Mother collected graves like others collect glass, or stamps, or musical instruments. Mom would stroll among the old raised stones and crouch before the broken angels. She traced the names of dead children with the red raw fingers of a woman who has scrubbed too many pots. 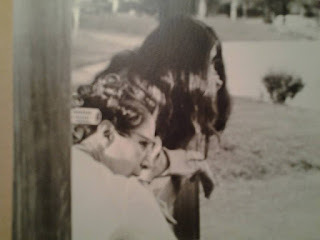 I carried the wax paper and knife in a paper bag and walked beside her, waiting for her to decide which stone to memorialize with a wax paper rubbing that day. I stepped between the graves, shuddering, apologizing in my mind to anyone beneath my feet who felt defiled. Mother had no such qualms. She sat with crossed legs on one person's grave while studying the Bible verse on the grave next to it. I hovered in the background, her daughter, but not like her. "Mom, come on, you know I don't like these places," I said finally. But my mother merely smiled and stood, shaking her head, beaming at me, continuing to wander among the dead. She found a baby's grave and reached for the wax paper roll. "Oh look," she whispered. "Just a few weeks old." She leaned down and spread a length of paper over the headstone and held it in position while she rubbed the blade of the knife across it to make the impression. Then the piece of paper went into a folder in the paper bag and we moved away, looking for someone else to visit. I stepped around the baby's grave with care. I felt my lips move; felt my heart cringe. A prayer like a sigh escaped from me and wafted to the heavens. When my mother had had her fill of visiting the long-dead relatives of others, we walked back to where she had parked the car. She sat behind the wheel for a few minutes, not starting the engine, not rolling down the window. She turned to me. "Will you come visit me, after I'm gone, when I'm buried? When I'm in the ground?" "Mom, don't be maudlin," I snapped. "Besides, you know I don't like cemeteries. They creep me out. Don't ask me questions like that." She looked away from her teenage baby girl and gazed across the green expanse, with its dots of stone and its towering angels. I don't know what she thought. She did not say. She started the car and drove towards the gates, pausing to look for traffic, illuminating her turn signal. "It's okay if you don't come," she finally said. I did not believe her. I shifted the paper bag to the floor of the car and turned towards my own window, away from my mother. "You're not going to die," I told her. "You're going to live to be a hundred and fifty, and you'll visit me in my grave and say, 'Oh look Mary, the lady beside you is named Irene and died in childbirth.'" My mother laughed. "I won't say that. I promise. Besides, a mother should not outlive her children, it's not natural." I didn't answer her. She pulled in front of our house and stopped the car. "Thanks for going with me," she told me. I shrugged. "No, really -- I mean it. Thank you. I know you think it's weird, taking these stone rubbings, visiting cemeteries, reading about the lives and deaths of people we don't know." I turned to look at her then; I did think it was weird and I didn't understand it. But I didn't say so. I just said, as quietly as possible, "Let's have a cup of tea." We left the car and went into the house, me carrying the bag of rubbings and supplies, my mother swinging her home-made corduroy purse. We lingered on the front porch, talking only of the living, until the sun set and the dregs of our tea grew cold. Then we went, together, into the kitchen, and began to make dinner. The gravesite of my favorite curmudgeon and his beautiful wife. As I listen to the NPR reports about the attacks in Paris, I feel a little shabby. The deaths of so many people make my life seem trivial; the terrible suffering on the streets of Paris overshadow any small problem that might plague me. Nonetheless, I sit drinking coffee, eating GF granola, and thinking about my Friday. The day began as days begin: Alarm rang, startling me from a terrible dream, but it was just a dream, and it quickly faded. I threw together the accouterments of an ordinary life -- warmed over coffee, sweater dress, food dumped in the dog's dish on the back porch and the cat's dish out front. Boots zipped, pocketbook draped cross-body, computer bag slung over one shoulder; out the door, down the driveway, struggle into the world's smallest rental car. I drove north to my auxiliary existence in Liberty. Once through the square, I slid into the handicapped spot on the curb by the courthouse. I saw a hand raise on the sidewalk, and returned the greeting of one of the Clay County judges. Ten minutes later, I mingled among lawyers who have adjusted to make a space for me at their Bar. My friend Pat entertained me with an account of the case she would be trying later that morning. Another female lawyer described her foot surgery, without seeming too disappointed at having to wear flip flops to in-chambers pre-trial conferences. A clerk offered to get coffee for me. I complimented a nattily dressed young male lawyer whose striped socks matched his pocket-square. By 9:30, I settled myself at a table in Morning Day Cafe. I couldn't get on the Internet so I moseyed up to the counter for password advice, and chatted with a cartoonist sketching while he ate his breakfast. Ten minutes later, he stopped at my table and gently laid a sketch down, For you, he said softly, presenting me with a depiction of a cat and a rabbit sitting in a coffee shop using a laptop which had a carrot for an emblem. A giraffe peered through the picture window in the background, a window strikingly similar to the one behind me. I put my hand out to touch his arm. Wait, please, I begged, scrambling in my bag for something to give him in exchange. My fingers curled around one of my more successful types of Law Firm pens, and I gave that to him. That's me, I said. Thank you for this picture. He smiled and made his way out the door. My friend Pat came after her trial and had a cup of coffee with me. We argued over who would pay the bill; she claimed it was her turn but I demurred, since she had not even eaten. She let me buy her coffee, swearing that she would retaliate by getting my lunch next time. An ordinary exchange but I left smiling. At the building where I've had an office for the last few months, I followed another lawyer into the building after parking behind Pat's car. 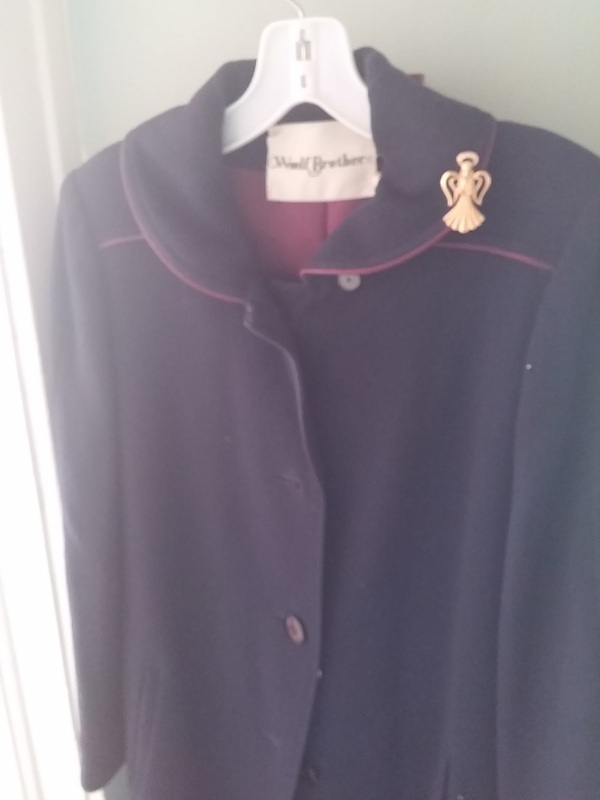 I discovered that someone had hung a beautiful blue wool coat on my office door, and left a bag of clothes. I lifted the top item and gasped at the soft beauty of a pale green shawl. At that moment, Trish Hughes, another lawyer who had, until this month, owned the building came into my office. You left me this beautiful coat, this lovely shawl, didn't you? And she admitted that she had. I thought they looked like your style, and I don't wear them anymore. A glint on the collar of the coat caught my attention. It's an angel pin! I gasped. Did you know about me and angels? She said she didn't; the pin hid a little flaw which she showed me. You don't have to keep the pin if you don't want it. Ah, but I do. I do. An hour later, a client sat in my office and cried about the difference between what her husband was telling her and what his lawyer had said to the judge and recited in the husband's proposed parenting plan. He said he would not take my girls from me, she whispered. I didn't even have a box of Kleenex to offer her. I could only gently guide her to a state of calm with a strategic plan which might or might not work. When she had left, I stepped into Trish's office and asked her to help me load everything she had given me into the car. Thank you for asking me to help you, she said in her lovely voice. I could not reply; I would have broken down. I hugged her though; and promised that I would see her next week. In the afternoon, I presented myself in the Outpatient Radiology department at North Kansas City Hospital for a chest x-ray. Undress to the waist and take off that necklace, the technician directed. I stood in front of her and contemplated making an admission; I did not like to do so, but I had no choice. I can't unfasten this necklace, I told her. If I need to take it off, you'll have to do it. She looked at me with something that I felt wanted to be distaste. But then, for some reason, she relented. I saw the moment flicker across her face. Maybe I reminded her of her mother; maybe she remembered what drew her to patient care in the first place. She stepped behind me and undid the tiny catch of the chain holding the smokey topaz which I rarely remove, and laid the lovely thing on the counter beside her clipboard. After the test, she just as carefully refastened the chain around my neck. I got a tea in the coffee shop where I have, on several occasions, sat and cried. But yesterday I felt no need for tears, only that bone-deep chill of approaching illness. The Earl Grey flowed through my body and warmed me, if only briefly. Back south, in Westport, at the car repair place, I told the woman behind the counter that I would not drive the rental car again. Can you call them, please, and tell them to come get it? She asked if I had had car trouble as she dialed the number of Enterprise Rental three blocks away from her establishment. Yes, I did; the cabin space is so cramped that I could not see over the steering wheel and I struggled to get in and out of the vehicle. I fell out of it onto a parking garage floor. She stared at me as though thinking, perhaps, that I had lost my mind. But she made the call. The manager of the car place transferred my bags and the lovely blue coat into the Prius and shook my hand just as the manager of the car rental outfit pulled onto the lot with a crumpled rental car. He strode across the lot. Mrs. Corley, he called. I hear you had some problems with our rental car, I am so sorry. We stood by the Prius while I explained the vagaries of having a spastic body, of shoving that body into a tight space. It was not the end of the world, but I just reached my limit of endurance. He apologized; he gave me his business card; he told me to let him know if I needed anything in the future. Then he, too, shook my hand, and I got into the Prius for the drive home. I pulled into my driveway, noticing the ten bags of collected leaves grouped around the tree on the parkway. What nice neighbors I have, I said, out loud, to no one. Earlier in the week, I had received a text from Scott Vaughn, one of the men next door, telling me that he would rake my leaves before the approaching city collection date. And sure enough, he had. I stepped from the car with the motor still running, my cell phone connected to the charger which I had left all week in the Prius. I started toward the front porch with my two bags: the computer bag in my right hand, the bag of clothes in my weaker, sprained, left hand. And I felt the twinge which tells me that I'm going to fall, and fall I did. When my head smacked against the backdoor of the Prius, my first thought was this: If I have to take it back for more body work, I want a bigger rental car. I lay on the ground amid the few autumn leaves which had drifted down from the nearly naked tree, in the hours since Scott had done his work. I peered at the grey-blue sky, wondering if it would rain; thinking about my cell phone eight feet from me inside the car, on its charger, sitting in the change tray. I had inched my way as far as the edge of the vehicle when I heard a voice and knew that I would be rescued. Brian Martig, my fellow Waldo-Brookside Rotarian and the contractor working on my house, bounded down the stairs, scooped me from the ground, and steadied me against the Prius. Eventually, the Prius parked, I made my way into the house. I shook the leaves from my back, onto the living room floor. I climbed the stairs to talk with Brian about the day's progress. I admired the finished plumbing and tested the LED lighting that will span the length of the attic closet that Brian designed and built. I lowered the drawbridge entryway, marveled for the thousandth time over the ingenuity of its design. I studied the amount of illumination cast from within the new closet. I voiced my thoughts about the position of the light switch. Then Brian packed his tools and made his way home to his wife, his son, and the promise of his unborn daughter. I watched an episode of Chopped. I perused the Internet news of Paris. I gave my son advice over the phone about refrigerated meat. I listened to voice mail from my friend Brenda. In the silence of the house, I thought about angels. I have no lack of them. In fact, I concluded, for such an ordinary woman, with such a mundane life, I seem to have angels around me in abundance. On the strength of that conclusion, I set the alarm, and went to bed. This musing will be shorter than usual. I'm typing with a sprained left hand which I'm told is riddled with arthritis. I'll be examining voice-to-type software; it seems my wrists, like the rest of me, have aged quicker than the average human. C'est la vie, I suppose. At least I can see the computer screen again, with my new specs. One lens has to be remade but even with one eye slightly off, my vision has considerably improved. Struggling to my feet yesterday, something that grows increasingly difficult, I thought about my mother. She's been gone half my life and I think of her far less than I do my father-in-law, whom I only knew for five years but whose death deprived me of a parental love of rare purity. But nonetheless, my mother's voice echoes in my mind. At nine years old, I tried to persuade my mother to enroll me in a dance class. We stood in the kitchen nose to nose. My stubborn nature compelled me to jam my little fists on my hips and glare. I could not understand her refusal. There was no charge for the first few lessons; I would have been willing to stop after that if we could not afford to pay. I just wanted to try. Mother pursed her lips. She raised her hands and placed one on each of my shoulders. Her eyes closed. She drew me against her chest. Mary, oh Mary, my sweet baby girl, she murmured. I felt a sob run through her body. A warm flush rose in me, spreading through my stomach, settling in my lungs. I could not breathe. I pulled back from her then. What's wrong, Mom? I asked. I followed the path of two single tears dropping from the corners of her eyes down her olive cheeks. She shook her head. You'll never be a dancer, Mary, she told me. I felt my eyebrows draw together. But why? I asked. Why can't I? She did not answer. My mother turned away from me then; she told me, go set the table for supper. She lifted the lid of the pot on the stove and stirred its contents, letting the fragrant steam waft into the kitchen. I did as she asked, getting the silverware from the cabinet across from the basement door and the plates from the cupboard hanging on the wall. My brothers and sisters wandered into the breakfast room and took their places at the table. My dad came up from the basement. Mother and I sat down last. Neither of us spoke as the prayer was said and the food was passed. When my mother had received her cancer diagnosis in 1984, all of us started spending more time with her. Walking in her garden one Saturday, a soft autumn day much like the one outside my door today, I asked my mother if she remembered my yearning to be a ballerina. She paused, then sank to the park bench. I do, she admitted. I deeply regretted not letting you take that damn class, she told me, then, for the first time. I should have let you dance. We fell silent. After a few minutes, she reached to take my hand and we sat together in the afternoon air. I don't know what she felt. She never said; and I never asked.